Free download IObit Malware Fighter Free. It is very light weight anti malware and spyware software which protects your system from all kind of malware in real time. A very advantage of this software is that it is compatible with all types of Antivirus software. After installing the program, it will show your computer at risk. To fix this problem you have to scan your system, update the program and fix all problems in action center option of this software. To fix the problems in action center, you have to install Advanced SystemCare, Smart Defrag and Advanced Mobile Care which will be installed with IObit Malware Fighter 2 by default. 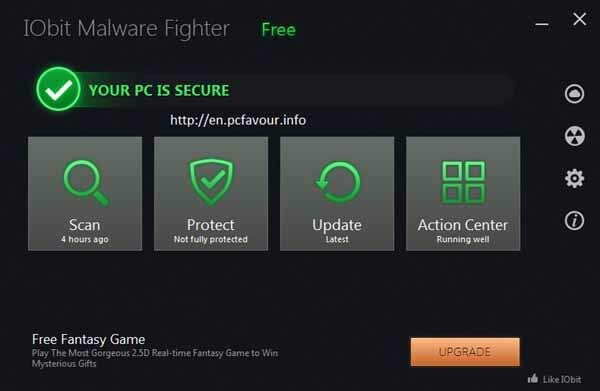 IObit Malware Fighter 2 Free has designed to compatible its layout with Windows 8. The program main screen has four main functions, which are Scan, Protect, Update and Action Center. There are four more options at the right sidebar which are cloud, Quarantine, Settings and about. These all are the options that are available in menu bar of a program. Cloud option tells you about threat files and safe files with respect to number of files and total percentage. Quarantine option shows you the list of infected files with their name, quarantine name and path. Settings option has some more functions such as general settings, scan settings, protect settings, update settings, notification settings and user interface. In user interface, you can change the language and increase the transparency of the program interface. General settings option is used to set 2 functions such as minimize the program to system tray when it is closed and execute the program when windows startup. Similarly, you can set all settings accordingly or can keep it by default.